It was a sultry morning a few Sundays ago. As my husband and I sat in our screened porch reading the latest news on our tablets, we knew the day was going to be a hot one. Summer was definitely here and I had a lot of yard work to accomplish before the heat set in. 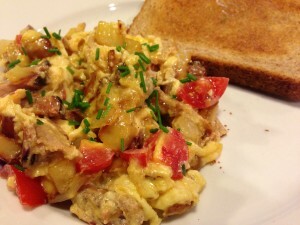 So, what to make for a hearty breakfast to hold us for a few hours? 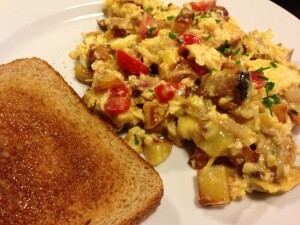 How about a Smoked Pork and Egg Scramble? 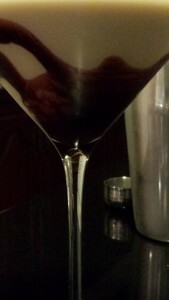 A great way to use some of the ingredients in my kitchen! 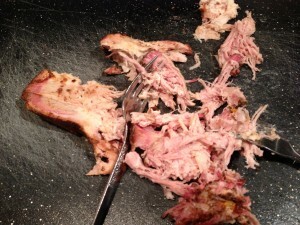 I started with a piece from the smoked pork shoulder. 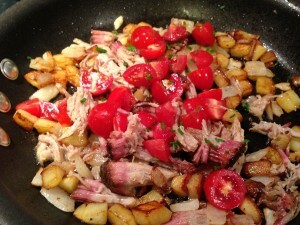 The smoky richness of the smoked pork certainly adds depth to this dish. I shredded it with two forks. 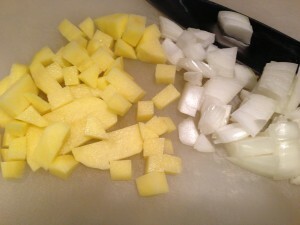 Diced some yellow potato and sweet onion. 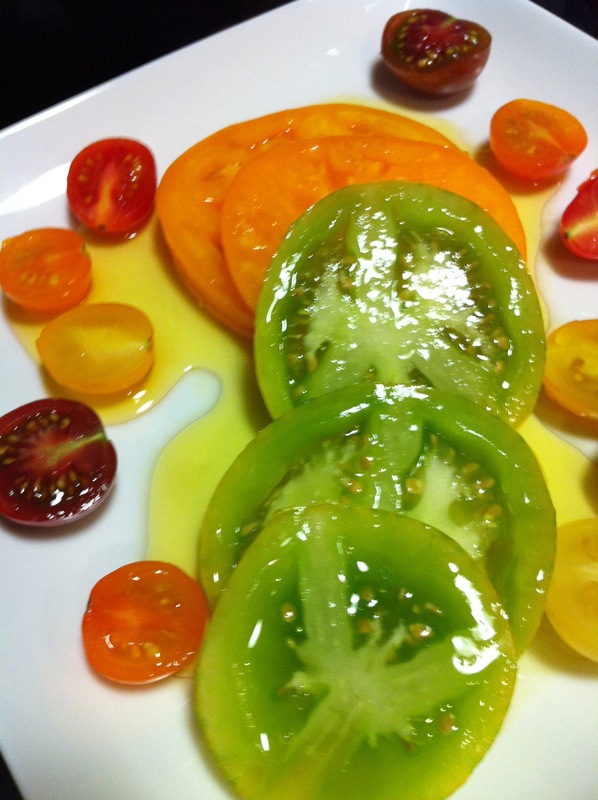 And quartered some ripe grape tomatoes, and chopped some chives from my kitchen herb garden. Sauteed the potatoes and onion in butter until lightly browned. 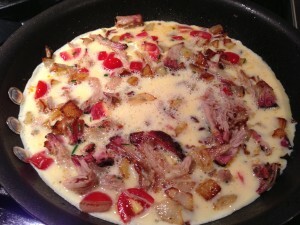 Added the shredded smoked pork and then the tomatoes and chives. Scrambled the fresh eggs with some heavy cream. Added the eggs to the pork mixture. 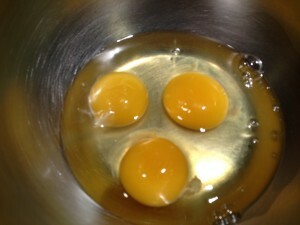 And stirred until the eggs were set. Added the cheese snd stirred until it melted. And served with chopped chives as a garnish! Serve with buttered toast or a biscuit. Add a pretty dish of ripe berries and diced cantaloupe or my Minty Fruit Salad on the side. Try this smoked pork and egg scramble for dinner, too. 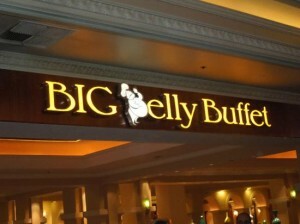 It’s tasty as a filling for breakfast burritos and breakfast tacos. Just heat up some tortillas and you’re ready. 1. 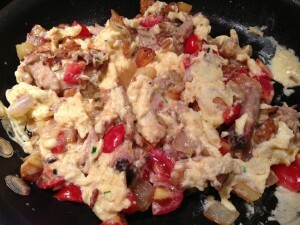 Over medium-low heat, melt the butter in a non-stick omelet pan. 2. Saute the diced potato until slightly brown and soft. 3. 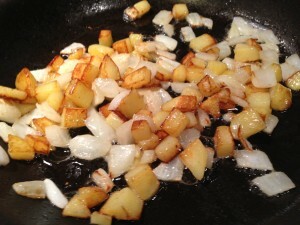 Add the diced onion and saute with the potato until the onion is translucent and the potato is cooked through. 4. Add the smoked pork and stir. Cook for a few minutes. 5. 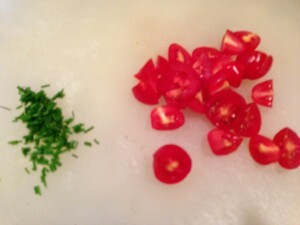 Add the tomatoes and half of the chives. Stir. 6. 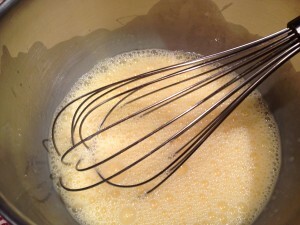 Whisk together the eggs and the milk or cream. Add to the pan, stirring as the eggs start to scramble. 7. 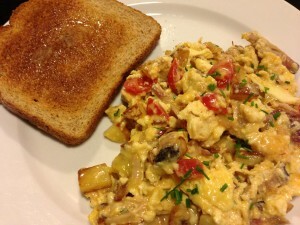 When the eggs have scrambled and the mixture is heated through, add the cheese. Stir to melt the cheese. 8. Divide between two plates, sprinkle with the remaining chives, and serve! Serves 2 as a main course. Offer whole wheat toast or a biscuit with butter and jam. 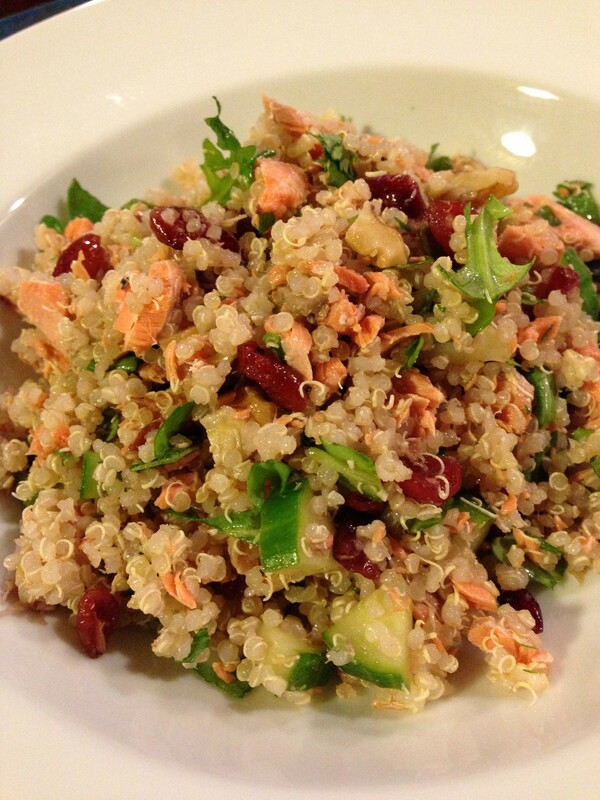 For a healthier side dish, try my Minty Fruit Salad! 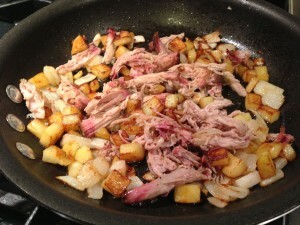 Variations: Substitute ham chunks instead of the smoked pork for a similar flavor. Substitute shredded Monterey Jack cheese for the cheddar. Add diced red or green bell pepper along with the onions and potatoes. Kick it up a notch with some diced jalapenos or green chile sauce on top. 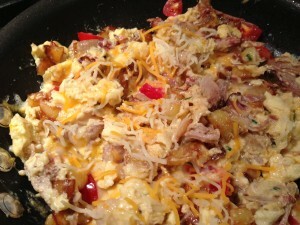 Also, this scramble is a great filling for a breakfast burrito or breakfast tacos!